As the time for Hugo Award nominations ends next Thursday night, I’m going through last year’s list of things I’ve read to pull out my idea of the best. Some I’ve already reviewed here, but there are two that I need to get reviewed before the deadline. The First is: Alice by Christina Henry. I’m a sucker for anything Alice in Wonderland. On the other hand, a take-off on this classic work that falls short is sure to get me ranting and raving. I’m happy to report that Ms. Henry doesn’t fall short, and in fact hits the mark beautifully. This surprises me because the descriptions of the book on the various retail sites left me a little wary. 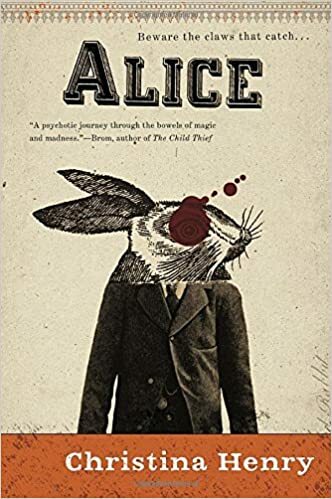 This is a dark and gritty take on Alice and her cohorts, with a feel I would call “Victorian Inner City.” Normally, this is not the kind of thing I would go for, but in this case I’m glad I did. Prepare to have your ideas of the Alice stories go to a very dark place, but to still retain the feel of the classic characters. Alice still feels Alice. The other characters are far different, but still are recognizable as related to their originals. But let me be clear about one thing: this is not a book for children. If you read this to the little ones as a bedtime story, prepare to have them never sleep again. If I have any complaint at all it is that the final showdown near the end of the book wraps up a little too neatly. However, this is not a big enough issue to have me lose enthusiasm for the story. In fact, I have many unanswered questions and suspicions that have me anxious for the next book in the series: The Red Queen, which comes out in July. I’ll be reviewing it here next year. If it holds up to this novel, then the series is sure to be on my all time favorites list. Christina Henry deserves highest praise for her work here. ← Book Review of nEvermore!